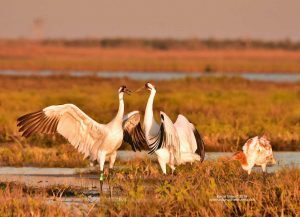 Excitement surrounds the first arrivals to South Texas of what is expected to be a record migration of endangered whooping cranes. While fewer than 20 of the iconic 5-foot birds have been reported by casual observers and birders north of Rockport, officials with the Aransas National Wildlife Refuge estimate that about 25 percent of the flock, or 100 to 120 cranes, may already be in and around the refuge. While a few had not left Canada as of this week, observers have reported seeing whooping cranes in every state along the Central Flyway from North Dakota to Texas, said the refuge’s Wade Harrell, whooping crane coordinator for the U.S. Fish and Wildlife Service. “Based on what we’ve seen the last few years, it’ll likely be late December or early January before the entire population is in coastal Texas,” Harrell said. The migration to Texas can take up to 50 days, with the population typically traveling in small groups and stopping to rest and refuel along the way. Chester McConnell, president of the Friends of the Wild Whoopers nonprofit group, has been negotiating with military officials and Native American tribes along the flock’s migratory route to boost crane survival. McConnell’s goal is to partner with landowners to enhance wetlands along the Central Flyway. This effort has resulted in unprecedented cooperation between the wild whooper group and the U.S. Army Corps of Engineers at suitable stopover sites in Texas, Oklahoma, Kansas, Nebraska, South Dakota and North Dakota, McConnell said. To read David Sikes’ entire article, click here. Fall migration is upon us and we expect to have our first confirmed whooping crane in the area later this month! 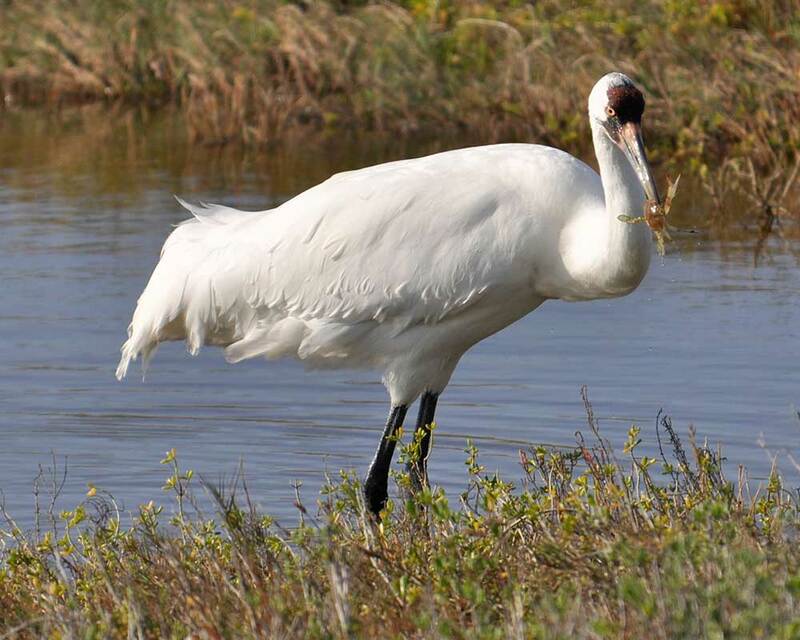 We have received a few unconfirmed reports of a few whooping cranes in Texas already, but have yet to receive a report with a photo or full description. If you have a question on whether the bird that you saw is a whooping crane or not, take a look here. Many early fall observations of whooping cranes end up being American White Pelicans or Wood Storks, though both of these species usually arrive in Texas before whooping cranes and are often observed in larger flocks. Cold and wet conditions early this summer contributed to a below-average breeding year in Wood Buffalo National Park (WBNP). Eighty-seven nests were counted in May, producing an estimated 24 fledged whooping cranes (counted in August) that are now headed south on their first migration to Texas. It is likely that lower than normal chick survival was due in part to exposure to the wet, cold conditions. We know from historical records that we see a dip in chick recruitment and the population size about once a decade, and we may be witnessing that pattern again this year. The Whooping Crane migration from Wood Buffalo to Aransas NWR is about 2,500 miles in length and can take as many as 50 days to complete. Right now, 9 of 11 of the whooping cranes that are alive from recent marking efforts in summer of 2017 and last winter have moved south out of WBNP and are in Central Saskatchewan. Three of these birds were marked as juveniles at WBNP and 6 were marked as adults here at Aransas NWR. It is common for whooping cranes to spend a long period of time in Saskatchewan this time of year, “staging” for fall migration by foraging on abundant agricultural waste grains. Our partners with the Canadian Wildlife Service are actively monitoring whooping cranes in Saskatchewan now and have reported seeing several of our marked birds. We have not received any migration reports from the U.S. portion of the Central Flyway yet, nor have any reports surfaced via eBird, Texas Whooper Watch, or other citizen science sites. Thus, it is likely that few, if any, whooping cranes have crossed the 49th parallel just yet. Once northern cold fronts become stronger, the pace of migration will increase. Be sure to report any Texas migration sightings via Texas Whooper Watch. For instructions on how to report, please refer to this website. September was definitely one for the record books, with at least 17.54” of rain reported at Aransas NWR. This is around half of our average annual rainfall, and as you can imagine it has created fresh conditions in the coastal marshes and standing water across large portions of the Refuge. Since June, we have recorded 36.19” of rain and the National Weather Service 3-month outlook suggests that the fall weather pattern will continue to be wetter and warmer than normal. Generally, wet periods bode well for whooping crane foods in the marsh such as blue crabs and wolfberries. 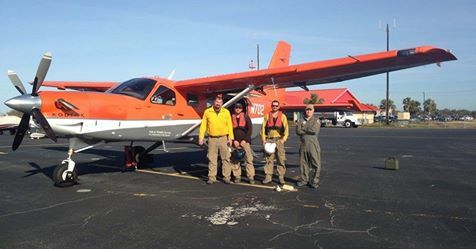 We were able to burn one large unit (3,780 acres) on Matagorda Island on June 15. The area we burned consists of upland prairies adjacent to coastal marsh areas that are heavily used by whooping cranes. By maintaining coastal prairie habitats in a relatively open, brush-free condition, we provide additional foraging habitat that would not normally be available to the whooping cranes. Summer burns are typically more effective at suppressing brush species in our prairies than winter burns, and thus are an important habitat management tool at Aransas NWR. I hope you will come join us at Aransas NWR on Saturday, October 13, from 9 am to 3 pm for the annual Refuge Day Celebration and participate in a number of free, family-friendly activities that we have planned – archery, fishing, kayaking, target shooting, live animal displays, arts and crafts, nature journaling, photo scavenger hunt, face painting, and more!